Whether you’re a photographer, designer, graphic artist, or just someone with a love for aesthetics, there’s a good chance you’ve used patterns for Photoshop before. Otherwise known as “textures,” these simple files allow you to create stunning images and shapes in your photos or pictures within a matter of seconds. Some patterns are as simple as dots and stripes, whereas others are complicated designs that provide an almost three-dimensional appeal. More often than not, designers use patterns for Photoshop when they’re creating backgrounds for their galleries, or pages for a website. So, which are the best patterns for photoshop available right now, and how can you use them? That’s what we’re here to tell you. Before you check out some of the best patterns on the market for Photoshop users, it’s a good idea to make sure that you know how to load these files into your program. One of the things that makes Photoshop so appealing to designers is how easy it is to use. Virtually anyone can learn how to master Photoshop over time. When it comes to loading patterns, all you need to do is make sure that you download the file containing patterns in a .PAT file. If the file formatting is right, you can simply double-click on the pattern to move it over to Photoshop. Once your pattern is uploaded, you can edit it further using Photoshop shapes, brushes, actions, filters and templates too! Now that’s covered, let’s check out some of the best places to go for patterns. The PS Patterns website might not be the most impressive to look at, but it’s packed full of useful resources if you’re a Photoshop user. Here, you’ll find over 50 patterns that are completely free to use, if you don’t mind the annoying pop-up ads getting in the way. 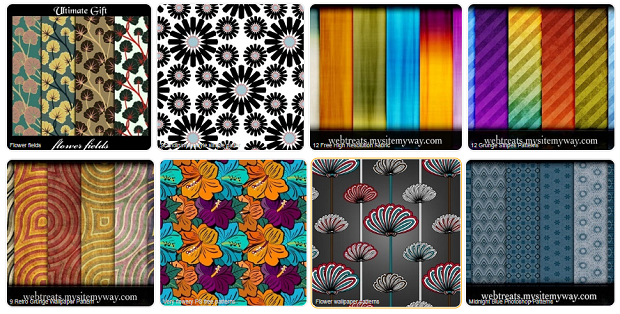 You’ll be able to choose from gradient stripes, flowers, polka dots and a lot more. What’s more, before you download a texture, you can see how large the file size is. These patterns for Photoshop come from a group called “Obsidian Dawn.” While some of the options aren’t the highest of quality, if you take the time to browse through, you’ll find some excellent high-resolution textures, including options like lace, stonework, tiles, and more. Unfortunately, not all of the patterns available here are free, but they aren’t expensive either. You may pay around $3 for a complete set. The download page will show you how many patterns you’re getting for the price – so you know what you’re paying for. If you’re looking for a range of high-quality textures and patterns, and you don’t want to pay a penny for them, then you can’t go wrong with Vasco Basque’s selection. There are plenty of different collections to choose from, organized by theme, like “lace” or “design.” Some of the files are a bit larger than you might expect, however, so make sure that you have enough time to download them. The patterns are also only available in JPEG format, which means that you’ll need to convert them yourself. Another free-to-use collection of patterns for Photoshop, this selection by “My Photoshop Brushes” comes with plenty of stunning images to choose from. You can even download zip files of each collection, which saves you some time and space on your computer. With more than 100 categories to choose from, you’re sure to find something that appeals to you. The only real downside to this website is that some patterns will require you to give attribution to the author if you plan on using them publicly. Of course, a little attribution is a small price to pay for some excellent PS resources. Another excellent source of patterns for Photoshop, Texturemate.com provides up to 20 textures that you can download in PAT file format. This saves you a lot of time on conversions. Within every ZIP folder, you’ll also be able to see an image of the pattern, for previews of whatever you want to use on your designs. It can be difficult to get a full overview of the patterns you’re going to get on the home page. However, once you click through to the file folder, you can see them in more detail. Many of the patterns are very high-quality here. There you have it, 5 excellent places to stock up on amazing patterns for Photoshop! Want more tips on how to make the most of your PS experience? Follow us on Facebook and Twitter.